Day 1411 - Happy New Years Eve! Greetings, Bloggy Celebrants and Revelers! Please note the moon in the upper corner of the photo. Did you know that we are in a 'blue moon' phase, and that the full moon is the second one this month? That MUST make this New Years extra special, somehow. We are going to have a low-key New Years Eve celebration - meeting Buddy Joe for pizza and calzone this afternoon, then coming back to the house and hanging out. I think I'll make a couple of small resolutions - hopefully ones I can KEEP. Overall - I think 2009 was a difficult year, so I am VERY ready for 2010. Bring it on! 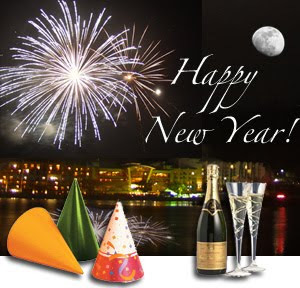 Whatever YOUR plans are today and tonight - take care, be safe, and have a wonderful New Years Eve. Watch out for all the crazies on the road who are NOT being safe. TTFN and Blog at ya next year! Greetings, Bloggy 'Waitin for the next day off-ers'! Reminder - the end of the year is drawing near - pay those December bills! Start thinking of writing 2010 on your checks! I had to dodge a small Christmas tree on the highway earlier this week. The ghost of Christmas leftovers walks among us. The seven open bags of chips and crackers with little content other than crumbs left in the bottom need to be thrown away. The multitude of plastic bags with leftover veggie tray items, the half eaten dip, the fudge I threw into the freezer to preserve it... They've got to GO. Just a couple more truckloads for the dump, a few closets to clean out, and I'll be ready to take down MY tree on the weekend. TTFN and have a nice Wednesday! Are YOU ready for a new year? 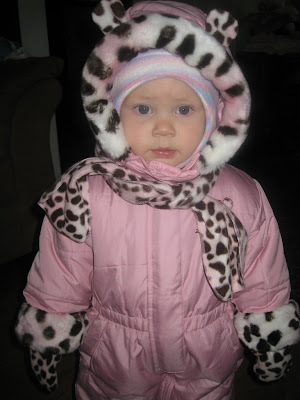 Here's yet another adorable picture of Miss Savannah in her adorable snowsuit. TWO much cuteness! Just a few days till New Years Eve - what are your plans? At the moment - we don't have any! Maybe just hang out at home and go to bed early. I have no desire to stay up till midnight anymore. New Years eve television is an extra big disappointment, it is excruciatingly bad. Did I spell that right? I need to make this short, I am running late this morning and haven't even gotten dressed yet. Here's a picture of our snow angel, Savi - with a fistful of snow. Yes, I did listen to Christmas CDs yesterday, and I enjoyed them! For many people, it's back to business as usual today. Christmas memories are just triggered by the astronomical credit card bills coming in, and whatever Christmas remnants are left in the fridge. Boo Hoo! No more parties at work, no more tins of candy and cookies around the office (unless people bring in leftovers, which is sometimes the case). Before he retired, Charlie used to get a big box of baklava and other Mediterranean pastries each Christmas from a vendor. One of his colleagues would bring in apple cakes that his wife had made for gifts. Well, we didn't really need anything else to EAT this Christmas - we haven't even finished what we have! We have TWO slices of pie left from the ones TY and SY brought over - one slice of chess pie, and one slice of pecan pie. They are amazing. My tenderloin roast is just about gone, maybe a couple slices left. Still have some chips and dip, but the supply is waning. I made ham salad yesterday with some of the leftover ham - we still have more ham! And last but not least - the tree and decorations are still up. Not touching those till next weekend. So - how is your POST-Christmas going? I've lost track of what day it is - it doesn't feel like Sunday. 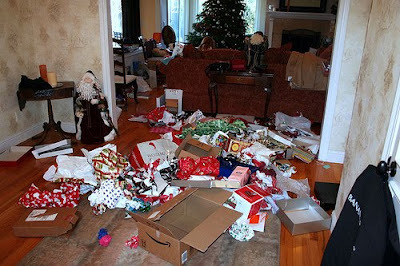 Here is a photo of someone else's Christmas trash pile. It's pretty big! We can't haul away Christmas trash till tomorrow, and I have NO immediate plans to take down the tree - it feels like it just went up! 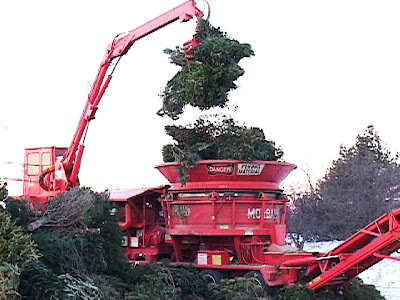 How long do YOU wait before you take down your tree? I'll bet some people are already taking it down. I feel like the tree hasn't been up long enough, and I feel like I didn't listen to enough Christmas music, either! I reached under the console in my car yesterday (between the driver and passenger seat) and I had several Christmas CDs in a CD case that I haven't listened to this year (because I forgot they were right in the car with me). DUH #1. I brought some jam to Charlie's brothers house yesterday, then forgot to give it out. DUH #2. Whew - hope I can actually remember something today! TTFN! 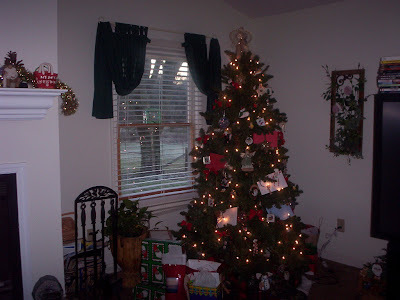 Greetings, Bloggy Post-Christmas Cleanup Crew! Charlie took at least 3 bags of trash out yesterday - two from the kitchen and one from Christmas wrappings. How can two people generate SO MUCH TRASH???? 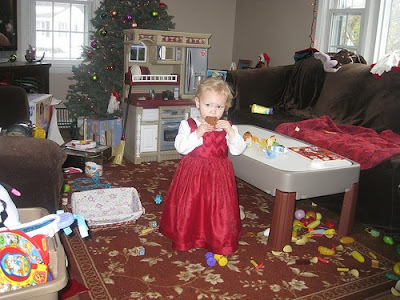 Heather posted this picture of Savannah amid the 'Christmas Chaos', as Heather referred to it. Toys and gifts everywhere is just right, with Savi in the middle eating a Christmas cookie. That is not nearly as bad as I had imagined, you'd already cleaned up all the paper! We are going to Charlie's brothers today - everyone have a nice day after Christmas! It's nice that Christmas was on a Friday - now theres a whole weekend to recuperate before the work week begins again. Day 1405 - Merry Christmas! 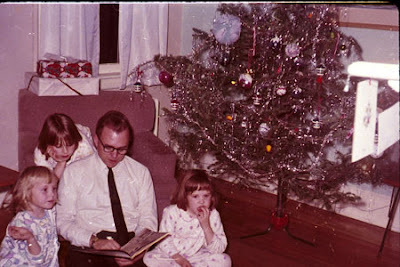 Here is an oldie but goodie from a Christmas LONG past in the 1960's. Did Santa come to your house last night? THANKS to everyone for my presents - they are awesome! 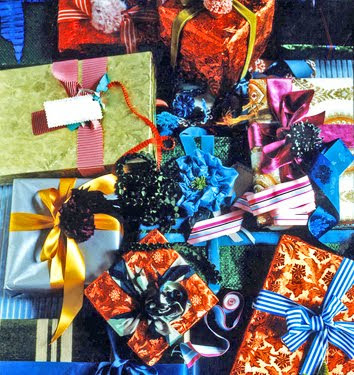 The present list includes clothes, a pine needle basket, ornaments, gift cards, books, and more. TTFN and have a Merry Christmas! Family and friends - I hope you have a wonderful, magical Christmas Eve and Christmas Day. I know we will! Aren't these adorable Christmas cookies? 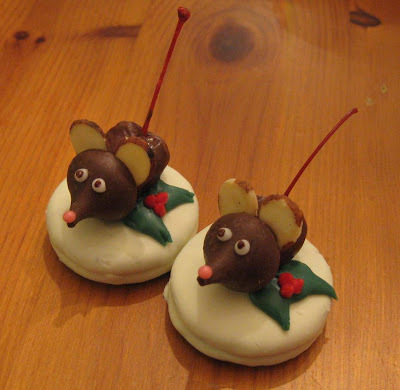 The mice are made from Hershey's kisses, almond slices and cherries. Too SWEET to eat! There is a reason I chose mice for today's photo. Yesterday at the health club I was doing my water exercise, and I was the only person in the pool. The lifeguard was busy in the pool office across the hall. Armed with empty plastic tubs, they flushed it out and then set out to capture the mouse (humanely, even) by barricading its hiding place with the plastic tubs and forcing it to run into one of the tubs. The maintenance man then calmly carried the mouse outside and put it out on the grass outside the club. Charlie and I can go to the pool today and see if the mouse managed to get back in. Have a wonderful Christmas and I hope everyone gets out early from work! Day 1403 - Christmas Eve Eve! I really have WAY too many things on my imaginary food list to be able to serve during the Christmas holidays, so I have to scale back. I have two true Christmas stories to tell, overheard at the health club - both of them funny yet tragic! Someone participated in an 'Angel tree' kind of thing this year, where you draw a name and age of a child and bring in a gift. The child was a boy, 3 years old. Easy right? Shopping for a child that age? No sweat. The 'shopper' has a closet at home where she and her husband stash emergency gifts, re-giftable items, and good deals that they put aside and save for when they are needed. She thought she had a train set in the closet, but when she couldn't find it, she chose instead a kiddie bat and ball set that her husband had bought at one time and put in there. After the gifts had been delivered, she discovered (when she told her husband) that the ball and bat was a valuable collectible that he intended to save for years and sell at a later time. OOPS. Overheard last week at the health club "I got my Christmas Wish! I got my Christmas Wish! Do you know so-and-so who has the really cute husband? They are getting a divorce and he is going to be on the market! I got my Christmas Wish!" 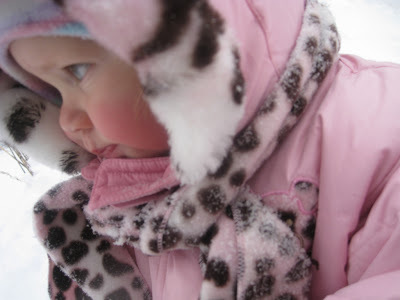 Here is OUR Christmas Angel, Miss Savi - all pink cheeked from the cold and snow. What a great close up! She is a very Norman Rockwell or Eloise Wilkin illustration come to life. It's just TWO days before Christmas Eve - are you ready yet? I'm ready except for another stop at the grocery store to restock whatever I'm out of. Do you find yourself wanting to have every food, snack and dessert you've ever associated with Christmas, all packed into a couple of days? For example, there really isn't a reason to make homemade cranberry sauce with a beef tenderloin roast. I need to wait until I cook the spiral ham I ALSO have, sometime during Christmas week. I also was planning cornbread dressing with a meal, but does that go with a roast? Nope. Better wait for the ham. Anyway - those are the kinds of things I think about instead of SLEEPING! Better go - I've got clothes in the dryer and breakfast to make. TTFN! Have you finished Christmas shopping? Have you mailed out all your Christmas cards? Look at Little Miss Adorable playing in the snow! Is she the cutest ever? I loved to play in the snow when I was little. And go sledding - or use one of those flying saucer shells. Sledding is great fun until you crash or hit a patch of grass (which stops you abruptly). 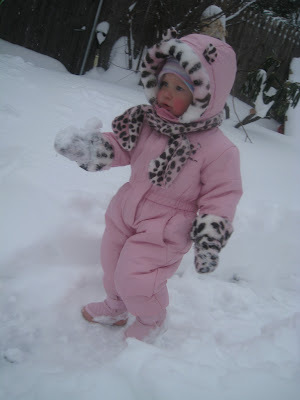 Heather - love her snowsuit, that must be the one you told me about at Thanksgiving. Hey - do the days start getting longer today? I am sick of waking up in the dark (in more ways than one!). Have a nice Monday-before-Christmas... It's almost time! Day 1400 - Come out of the Claus-et! Chai and Julie - thanks for the ornament and card, is it on our tree! Joe - we aren't going to go see 'Avatar' today, we're going to see 'The Road' here in Cool Springs. I haven't told this story for a year or more, so here goes. When I was little, we used to get a note from Santa pinned to our stockings on Christmas morning. How I wish I had saved them! 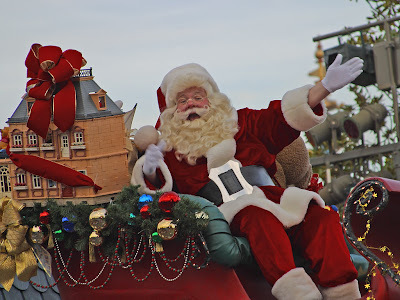 I haven't heard of many kids that get a personalized message from Santa Claus - did YOU? Anyway - it was very special to us, and by the way, we never tried to match handwriting or guess who else might have written the notes. Another nice tradition - a friend of mine (Melissa) said her children were always allowed to open one present on Christmas Eve. The present was either new pajamas or new bathrobes. They wore them on Christmas morning so their pictures always were extra-special. I think that is a great tradition, if you're looking for one. Another tradition was to have an orange in the toe of the stocking, unshelled nuts, and candy, of course! Nothing nicer than seeing a candy cane peeking out of the stocking! I also hung candy canes on the tree. TTFN and have a great Sunday-before-Christmas! Greetings, Bloggy Weekenders and Last Weekend Before Christmas Shoppers! I have ONE more thing to buy, maybe I'll get around to that today. Here's a great Christmas picture from a place called Santas Village. I haven't been there but it would be fun! 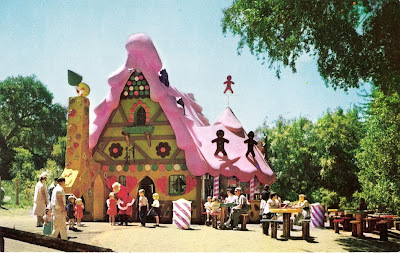 I did go to Storyland though, many moons ago. Heather - you need to take Savannah to Storyland in New Hampshire, and I apologize for not taking YOU when you were little! Actually, you can wait till she's a little bit older, like 4 or 5! Go see www.storylandnh.com for more info! Next Friday we'll be waking up on Christmas morning and seeing what Santa has brought! I would let the kids open their stockings very early in the morning to entertain them until DAYLIGHT when I would get up. 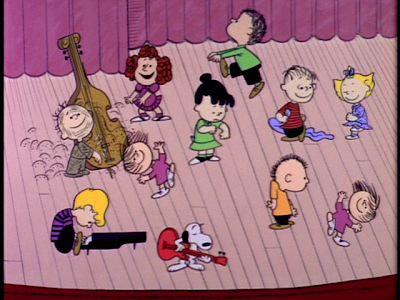 This is one of my favorite Christmas scenes from the Charlie Brown Christmas special - the kids dancing. They each do their own special 'moves' over and over again - whenever I see it I laugh! I still have ONE more thing to buy... but yesterday I forgot! Ha! I have been grocery shopping and cooking up a storm and it isn't even Christmas yet. Yesterday I cooked boneless ribs and grilled up and froze 6lbs of chicken tenders (so they'll be all ready to use for whatever I feel like making). GOTTA RUN - TTFN and have a nice Friday! Day 1397 - Chocolate Walnut Fudge! Happy Birthday to my nephew Timmy today! 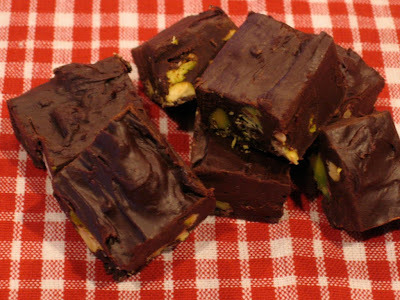 A pound of dark chocolate walnut fudge showed up yesterday from the Candy Castle - Mt. St. Helens Fudge Company. Heather - did you send it? I've already eaten some and it is deeeee-licious! I am running late so have no time to blog, I need to get ready for water aerobics class. Gotta go - hope you have a nice Thursday! Greetings, Every Who down in Whoville! 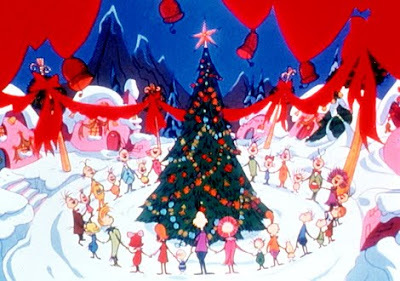 I forgot to mention 'How the Grinch Stole Christmas' yesterday when I was talking about Christmas specials. I never saw the movie - was it any good? I could rent it with Netflix and see. Dr. Suess rocks - I just love his books and the illustrations that go with them. They are a big part of my childhood and my kids' as well! So - Whassup? Are you done with your Christmas shopping? Do you know what you're cooking for Christmas dinner? Have you stocked up on brown and serve rolls before they're sold out? These and other important questions can be answered in the comments section. Thanks for your patronage. (ha!) Have a nice day! 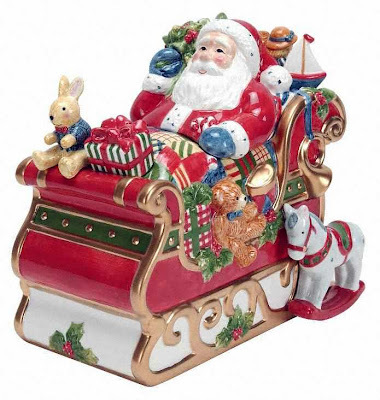 Here's an awesome Christmas Cookie Jar - you can imagine all kinds of goodies in there. Hey - has Rudolph already been on this year? If it has, I missed it. Has Charlie Brown's Christmas already been on? If it has, I missed that too. I've finally got my stuff ready to mail at the post office this morning. Gotta go GET IN LINE! 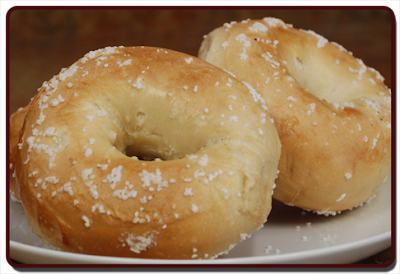 First - apologies for getting the name wrong for K&K bagels in yesterdays blog, and thanks to Buddy Joe for pointing out my dead brain cells. Kidding, but not really! Second - if you have to get stuff into the MAIL for Christmas - better do it! That means ME. 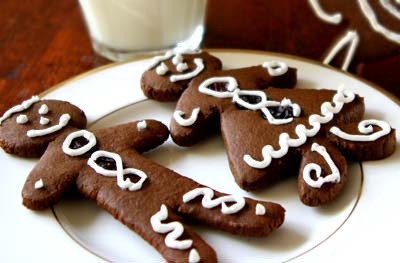 Todays photo shows some awesome gingerbread people. What makes them awesome is the combination of gingerbread, raisins and white icing. Every now and then I feel like eating gingerbread - it's not my favorite but it definitely brings 'HOLIDAY!' to mind and palate. I also like gingerbread topped with whipped cream, but I can't remember the last time I had it - YEARS anyway. Charlie and I went to see '2012' yesterday. Yes, it was pretty lame and overly long, but chock-full of non-stop special effects. Did I tell you about my 'pretzel bagel' craving? My favorite bagel place of all time - (Big K's in Mt. Juliet) closed. One of their specialty bagels was a pretzel bagel - a cross between one of those giant hot pretzels at the mall, and a bagel. So - I decided to go on a mission to find them elsewhere.... Good luck. After striking out multiple times, I found a bagel bakery who said they could make them, and I put in an order for a dozen. They were still warm when I picked them up, and I was SOOOO excited. Turns out their idea of a pretzel bagel, and Big K's idea of a pretzel bagel were different. What I got was a 'salt bagel' - more like a plain bagel with coarse salt on it. This might still have been fine, but there was a TON of salt on each bagel, not just a sprinkling as shown on this picture. I brought them home and scraped most of the salt off each one with a knife, and even RINSED a couple of them. (waste not, want not). They are just fine for breakfast sandwiches, I didn't destroy them, and I bought some other bagels (like egg and pumpernickel) there that are awesome. The moral of the story is - don't ASSUME you and your suppliers are talking apples and apples - you might be ordering apples while THEY are boxing up oranges. Are you Christmas shopping today? Are you done yet? Have you mailed your Christmas cards? Speaking of cards, my used to be favorite Factory Card Outlet in Franklin is no longer on my shopping list. I won't even plan to go in there anymore. What a bummer! It was a great store, and now it's ruined. Cards used to be 49 cents each. Then they started mixing in 99 cent cards. Charlie and I went in there this week, and it is now just '50% off' the original card price, and the selection and quality of cards is AWFUL. Alternative place to buy better cards - 'Deals' stores, where most cards are 2 for $1. Speaking of shopping - stores are already packed with frenzied and stressed out Christmas shoppers. Even GOODWILL is full of people trying to find some treasures to use for gifts. 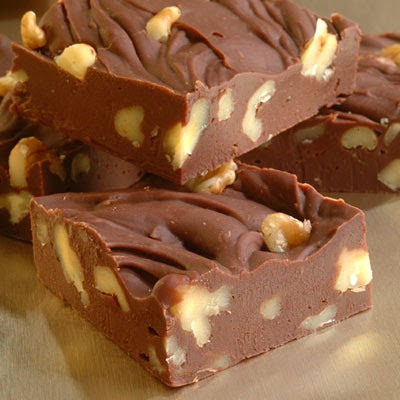 Preferably darker chocolate than this photo, but this photo of chocolate walnut fudge looks AWESOME, doesn't it? For a photo - that is mouth watering GOOD. There are many wonderful things going on today! First - I have my tree decorated, only 11 or so days late. I am very thankful. I am having lunch with some of my 'home gals' - which will be fun. In addition, it's Friday, the best workday of the week, and it is also my brother David's birthday. 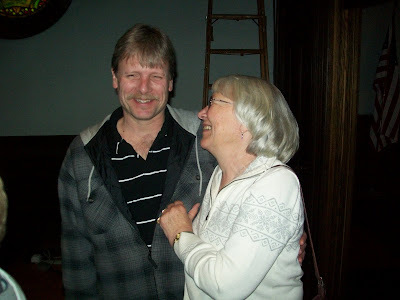 Here's a picture of David and my mother on Thanksgiving Day, laughing. Very cute! My poor brother has three older sisters who persecuted him mercilessly, making him an expert on Venus vs. Mars. Day 1390 - The lights are ON - finally! Yesterday I bit the bullet and got the lights on the tree. Hooray! That is a huge accomplishment, because I've been meaning to do it since Thanksgiving! No, don't think I'm done - this photo is of LAST YEARS tree. This year I have both white lights and blue ones intermingled on the tree. I still need to put the ornaments on and all that kind of stuff. That's the easy part. The lights are the hardest. Changing subjects - you know when you search and search and search for something, then buy another one and immediately find the original thing you were searching for? I did that this week with a lint roller. I looked in all the usual places for it, and could not find it. So I bought a new 2-pack at Walmart. Then I found the original one under a pillow next to my recliner in the den. Oops. It's not like I won't USE them - but it was an aggravation not to find it to begin with! Heather and family - get well and go to the doctor if you need to! Heather - hope you and yours are getting well, even a little at a time! Get well before Christmas! I haven't given up on my Christmas cookie theme this week. Visions of Sugar Cookies are dancing in my head... or attaching to my...whatevers. 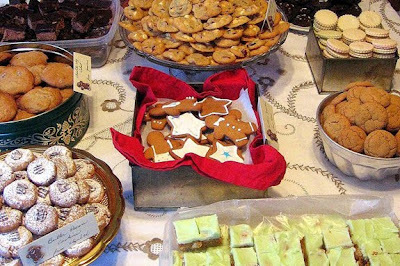 This photo shows a Christmas cookie swap. If you haven't been to one - this is how it works. Every participant makes a big batch of their favorite cookie(s). They are then allowed to swap.trade their cookies for someone else's, so they end up with an assortment without having to make them all. I think it is a great idea, as long as everyone's cookies are 'up to par' and delicious! Day 1388 - Christmas.... COOKIES! I hope Savannah is better today, Heather! My mother sent me some recipies yesterday for Christmas holiday goodies. Thanks, Mom! 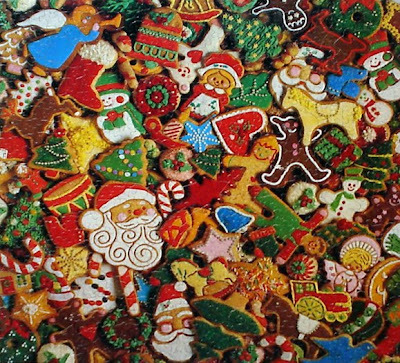 I have been thinking about Christmas cookies after watching a segment on the food network. Yes, I love Christmas cookies, but only certain kinds. Magic bars - number one. Almond crescents with just a hint of powdered sugar - number two. Oatmeal Date bars - number three. Cookie DOUGH - number four. Do you bake cookies for the holidays, and what are your favorites? Chat among yourselves, and post a recipe if you have an extra-special favorite! Day 1387 - Monday already! 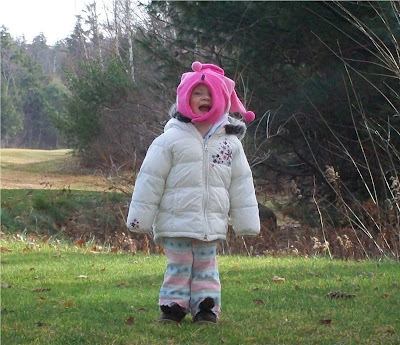 Here's a cute photo of Savannah hollering from the depths of the pink jester hat I bought her last year. Too cute! I am in slow motion this morning - so I'll just click and run here. I received my first Christmas card yesterday, and haven't even written ONE. Oops. I think that's a nice message. Get well soon, Savannah! Nothing like colds this time of year, I've had sniffles for 2 weeks now, but they aren't really bothering me. 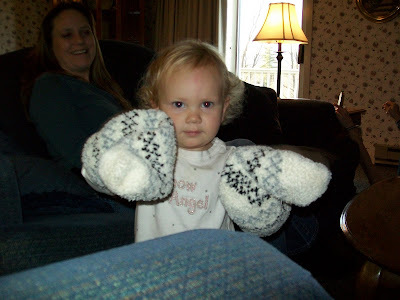 I love her expression in this picture, she looks like she's ready to start boxing with my big fuzzy socks on her hands. Too cute! Have a nice rest of the weekend, everyone! I need to get the lights on the tree SOON! I need to leave for water exercise class, so the blog will be short. Here's a cute photo of Savi to keep you company. I got up at 6, but started puttering around the house instead of blogging first. Buddy Joe is coming over this afternoon, so I've got some 'company coming prep' to do. OMIGOSH, I just got it into my head that it's Friday already! Good grief, where did the week go? Here is one of my favorite Thanksgiving 'Savi-isms', with a photo of the event. 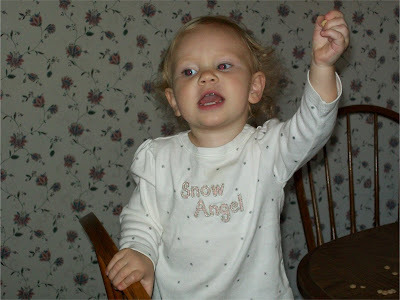 When she wanted to share a Cheerio - she would hold it up in the air (pictured) and yell 'BITE IT!' at the top of her lungs. How adorable is that? She shared her Cheerios and we were happy to help her eat them. You know, Cheerios are good, pure and simple. I ought to go buy a box. Charlie likes the honey-nut ones better. Gotta go! Back for another doctors appt this morning. TTFN! 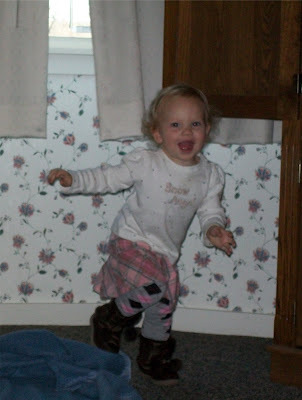 Here is an action-packed (and totally adorable) shot of Savannah on the move. We did that over and over, by the way, and I have a lot of different pictures from that little game. I think I bought Savannahs 'Snow Angel' shirt on a fall shopping spree in Pigeon Forge, TN near Gatlinburg. If I didn't get it there, I got it at Opry Mills - also known as 'Shopryland'. I've got a very busy morning today - a swim at the pool to get my metabolism going before spending several hours at the doctors today. Day 1382 - Christmas Eve Minus WHAT? In Between What? Thanksgiving and Christmas - that's what! Have you even THOUGHT about Christmas cards and presents and shopping and budget yet? Er - I really haven't. 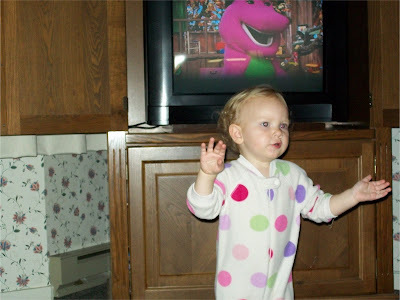 Here is a cute photo of Savannah dancing to her Barney video. Too cute! Hey - for all the computer wizards who read my blog - we have an explorer or ?? malware bug to fix. It is just an aggravation - the symptom is that it opens a new window periodically with advertising of various sorts without my clicking on any advertising. How do we get rid of that? I've got popups blocked, but as I said, a new window gets opened, an ad comes up, and I have to shut down that window. Spybot, Adaware and Malwarebytes do not find it. 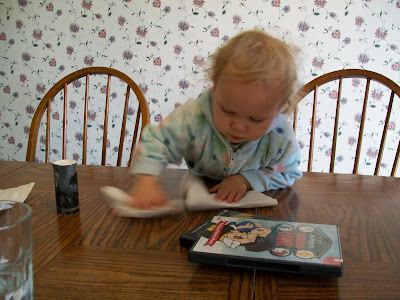 Here is a photo of Savannah busily wiping off the table with TWO hands after dumping out the pepper (from my awesome and nostalgic Lord of the Rings Salt and Pepper Shakers). Too adorable, even when she's cleaning. 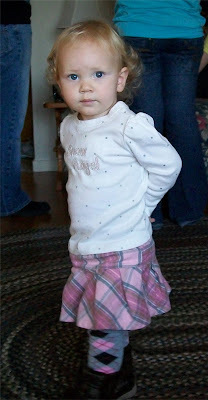 By the way - I gave her that very cute outfit she has on. I will confess that I gave it to her LAST YEAR, and it fits this year. Good going, Grandma. Notice the video of Mr. Magoo's Christmas Carol on the table - I brought that one and Laurel and Hardy's March of the Wooden Soldiers, which are traditional Christmas must-haves for me. Savannah enjoyed Mr. Magoo, and ignored Laurel and Hardy, preferring the Wiggles and Barney. I bought a box of Cheerios for Savi's visit - and she had a great time eating them and sharing them. She would hold up a Cheerio and yell 'BITE IT!' for someone to take it. That was great fun. I have doctors appointments every day this week - so I'll move along.